Kas is the eyebrow which frames the blue eyes of Mediterranean. 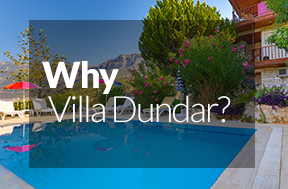 Villa Dundar is the smile which illuminates the beauty, intrigue and delight of a Turkish Riviera holiday. Located on the south coast of Turkey near Antalya, the small town of Kas is at the very centre of the historic Lycian Region, bordered by the Taurus Mountains on three sides and sandy beaches and calm, blue Mediterranean on the other. Dalaman Airport is 150 klms away and Analya Airport 180 klms away with road transport available from the airport by coach, taxi or rental car. 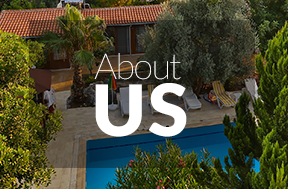 Once in Kas, most of the activities and attractions are within easy walking distance of Villa Dundar. The rocky terrain helps keep the sea waters clear and contain many ancient ruins, tombs and relics of the ancient city of Antiphellos, which can be explored by land or water trips. Kas is the home port for many yacht and boat trip operators, in particular www.boattripturkey.com and www.sailinkas.com offering day and multi-day holidays along the Kas Kekova Riviera. The cool clear waters are fantastic for swimming and diving and exploring many of the underwater ruins which are visible in quite shallow waters. Once the site of the ancient city of Antiphellos, Kas is now a charming village where you can wander through these historic streets, browse the souvenir shops and local stores offering Turkish handicrafts, leather goods, silver items, cotton clothing and handmade carpets. 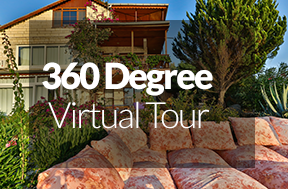 Spend your days relaxing in the friendly village atmosphere, strolling the flower-lined Akdeniz Promenade and enjoying the selection of local and international cuisine and drinks at the many bars and restaurants in Kas. For the more active and adventurous, the surrounding mountains beckon. You can take walks through forested hills to visit remote villages and ancient ruins and attempt to scale the highest peak in the area, Mt. Kizlar Sivrisi (3,086 metres). Ancient history is alive in Kas and one significant point is on a rise between the open sea and the hill, which was probably the acropolis of the ancient city, lies a rock tomb formed like a Doric structure with Doric triglyphs on the facade. Inside the tomb is to be found a frieze of dancing female figures. The acropolis was surrounded by a fortified wall, of which traces are to be seen on the facade facing the island of Meis (Kastellorizon). To the west of Kas stands the ancient theatre overlooking the sea. This structure possesses a remarkable view. It was constructed of local limestone and today the tribunes and outer walls are still visible although no trace of the skene is left. On the western edge of the acropolis are traces of a temple. Tombs of the Roman period are scattered about the town and along the coast. Kas has already been discovered by many astute travellers and holidaymakers, but still remains somewhat of a hidden paradise within the alluring waters of Mediterranean Turkey. We are closed for winter season between 31 October - 1 April every year!